Make the pastry by sifting the flour into a large bowl. Rub in the butter with your finger tips until it resembles breadcrumbs. Mix the egg, add to the flour and bring together with your hands. Add the water and knead on a cold floured surface until fully mixed. Wrap in cling film and chill for 30 minutes in the fridge. Remove your pastry from the fridge and roll out on a floured work surface until it’s an even thickness of about one centimetre. Get your loose bottomed tart case (20 centimetre diameter by three to four centimetres deep). Grease the tart case with butter then line it with your pastry, making sure you press into the edges of the tart case all the way round (use a two centimetre ball of pastry to do this to stop from piercing the pastry). Prick all over the pastry base with a fork, to release trapped air and stop the pastry from rising. Line the pastry case with parchment paper, fill it with baking beans or rice. Then place onto a baking tray and bake for 15 to 20 minutes at 190°C/gas mark 5, then remove the beans and the paper from the case, brush the pastry with a little milk or egg wash, then pop back in the oven at 180°C/gas mark 4 for 10 more minutes until golden, remove from oven and set aside. Melt the butter in a pan and add the diced smoked bacon, fry until golden brown and cooked, then set aside. Now get your asparagus spears trim off the hard root, cut them length ways then add to a hot griddle pan with a little oil & cook until charred. 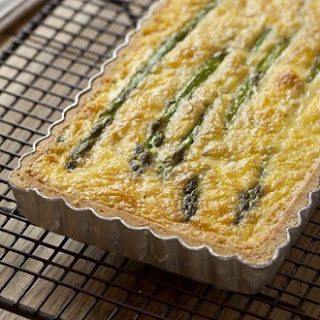 Spoon the bacon mixture into the cooked pastry case, add the asparagus and crumble the goat’s cheese on top. Make your mix up by adding the cream & milk to a jug adding the eggs and whisking together, add a little salt and pepper to season. Pour the mix into the pastry case, don’t worry if you have some mix left over. Sprinkle the top with the grated parmesan and bake the tart in the oven at 180°C/gas mark 4 for about 20 to 30 minutes until the filling is golden and the mix is set.